Over the next week families in Québec and other parts of French Canada will be busily preparing a dish that is traditionally eaten at Christmas time – Tourtière! On Christmas Eve, after mass, this savoury meat pie will be centre stage at the midnight feast known as réveillon. While I do not live in Québec, I have happily adopted this dish as part of my Christmas tradition and prepare it every year for my family and friends. I consulted with a couple of my Québecoise friends as to the origins of the recipe and learned that the name of dish comes from an extinct bird, the “tourte”, whose meat was generally used for the pie. However, today many different combinations of meat are used, depending on the area of Québec and the tradition of the family, but generally some combination of beef, pork and/or veal is used. During the Christmas season you may expect many of your guests to gift you with their own homemade tourtière for your gathering, such that your party table may sport 3, 4 or even 5 different pies! What a great tradition! The recipe I am presenting here is not your typical French Canadian Tourtière as it has a few added ingredients such as cheddar cheese, bread crumbs and milk, but it is delicious nonetheless and garners ooohhh and ahhhhs at the table. The pastry is rich and dense in order to hold together such a substantial pie and the combination of spices are subtle yet warming. You may wonder what the red sauce is in the photographs…well, it is…ketchup. Some of you may find that a bit banal for the centre piece of your Christmas table, but my palate likes it and that is what I serve it with. One of my French friends told me that you might expect to find tourtière served with a homemade ketchup in Québec, but I haven’t tried to make one yet; maybe because I am happy with my favourite brand of store-bought ketchup! This recipe has been adapted from Diane Clement’s, Chef on the Run. I hope you like it! Bon appétit and Joyeux Noël! Mix flour and salt in a bowl. Add small pieces of butter and blend until it flakes. Mix egg and sour cream and add to flour mixture and blend quickly just until it forms a ball. If the mixture is a bit dry, add 1 – 2 tablespoons cold water. Wrap in wax paper and place in refrigerator. This can be made 2 days ahead of making the pie, or it can be frozen and used at a later date. I made my dough in the food processor and it needed the extra water that I mentioned above, in order to form into a ball. Melt butter in a skillet and sauté the onions and mushrooms until tender. Remove from the pan and set aside. Add meat to skillet and sauté until browned. Remove the excess fat, leaving about 1 tablespoon. Return the onions and mushroom to the pan and add seasonings, milk, bread crumbs, egg and cheese. Simmer over low heat for about 5 minutes. Refrigerate for about 20 minutes until chilled. Divide chilled pastry in half. On a floured board, roll pastry into circles that are larger than your pie plate. Place one round of pastry in the pie plate. Add the meat mixture. Trim the pastry even with the edge of the pie plate. Place the second round of pastry on top of the meat and trim 1 inch wider than the plate. Tuck the top pastry round under the bottom one and crimp to seal well, using thumb and forefinger. Brush the top and edges with a mixture of 1 egg yolk and 1 ½ teaspoons water. Slash the top of the pie several times. Bake at 375° for 45 to 50 minutes until golden brown. Serve the tourtière at your Christmas feast. If you are lucky enough to have any leftovers, have it the next day for lunch with a salad. What a beautiful and festive looking dish. The french definitely know how to pastry, thanks for sharing Julianna! Hey, thanks GypsyMoon! Yes, you’re so right about the French and pastry!! Have a great Christmas! Thanks Jess! Nice of you to stop by my blog and take the time to leave a comment! Happy Holidays to you! Diane Clement’s tourtiere has been our family favourite since she published Chef on the Run about thirty years ago. Flavours are subtle so we ensure ingredients are the best available. We prefer to grind our own meats, using boneless short ribs and sirloin steak tips from grass fed beef and shoulder cuts from pastured heritage pork. This is not supermarket meat; it’s from neighborhood butchers dedicated to selling meats ethically and humanely grown on farms not too far from home. We also like to use aged cheddar and our preference is for a lard pastry. I suspect we could compete with you on taste, but your pictured sample would win on appearance. Very attractive. This year, we did four pies because our adult children appreciate taking portions home. This has grown to be a taste our family associates with the holidays. but it is a hearty meal anytime. Wow! Sounds fabulous! Next year I will have to source out some of the lovely meats you use. It is so nice to know that other people are familiar with Diane Clements; I have been a fan of hers forever and you are so right about the taste being associated with the holidays! That is the same in my house. Thanks so much for stopping by the blog and taking the time to make a comment! Happy New Year to you! 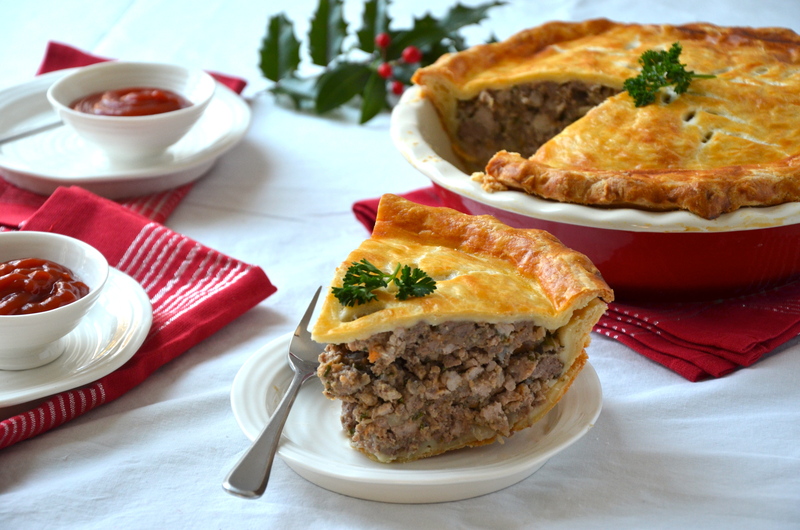 I know I am a little late, but I just came across this recipe, the tourtiere looks absolutely perfect, loaded with meat filling and a perfect golden crust -yum! Hey Lily. No worries about being late!! Good recipes are timeless 😀 Yes, it is an amazing tourtiere and I make it every year at Christmas time for a special treat! Let me know if you make it. Than you so much for publishing this recipe adapted from Diane Clements. I have lost my raggedy copy. I made the tourtiere filling from memory today and, according to your instructions, missed only the celery salt. Thanks for letting me find the sour creme pastry recipe. One of my favourite things is the sauce you left out — sour cream with a hint of dijon mustard (don’t overdo). By the way, “tourte” is an old way of saying “tarte,” which is the French word for pie. 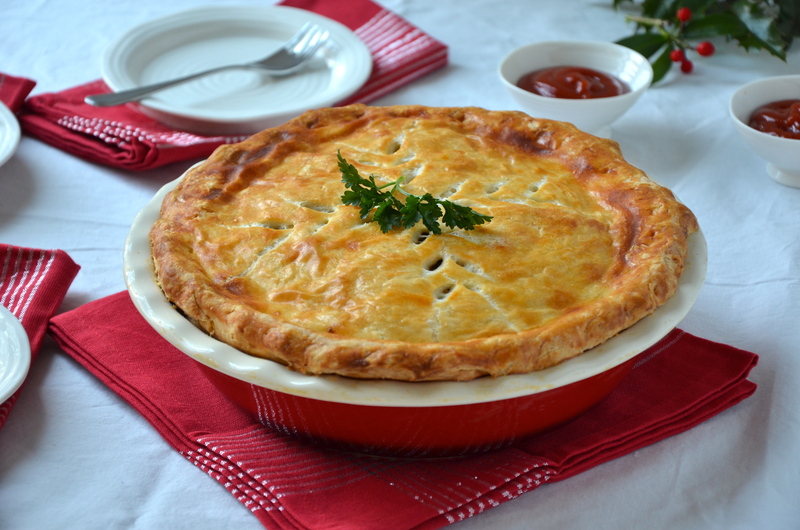 A “tourtiere” is the pie dish in which you baked pie. In a Catholic household, the pie is served after church as an to end to the Christmas fast; this is the first meal that includes meat after a number of meatless weeks.